How notable is your ancestry? The (Fred Johns 1906) is the first book of its kind to be issued since Federation. 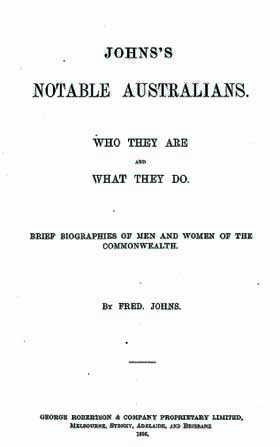 It is the forerunner of what became Australian Who's Who - effectively the first edition of this.Arranged alphabetically apart from a special section dealing with government of Australia and each of the states. It has approximately 1300 brief biographies of men and women of the Commonwealth. It also has a list of 'Notable Dead' at rear. This is a rare genealogy resource that's perfect for anyone exploring their family history or building their family tree.